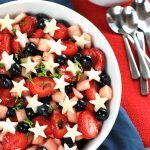 Sweet juicy strawberries, plump blueberries, and crisp jicama, together they make the perfect patriotic salad. This Strawberry, Blueberry, Jicama Salad is easy and deliciously healthy. Memorial Day, a day to honor all of the fallen men and women who have served our country. I just want to say thank you to all their families who have also made a sacrifice and to all the men and women who continue to serve. Memorial Day also symbolizes the beginning of summer, and this Strawberry, Blueberry, Jicama Salad is perfect not only for Memorial Day but all summer long. It has lots of flavor, but not a lot of calories. You can enjoy it without worrying about your waistline. If you’re like me and need a dish to take to a gathering this weekend, this is one that’s quick, easy and deliciously healthy. I put this together in 20 minutes. For anyone not familiar with jicama, it is a round root vegetable very similar to the texture of a turnip and has a taste closer to that of an apple. For more info on jicama, check out What is Jicama Good For? at Food Facts. 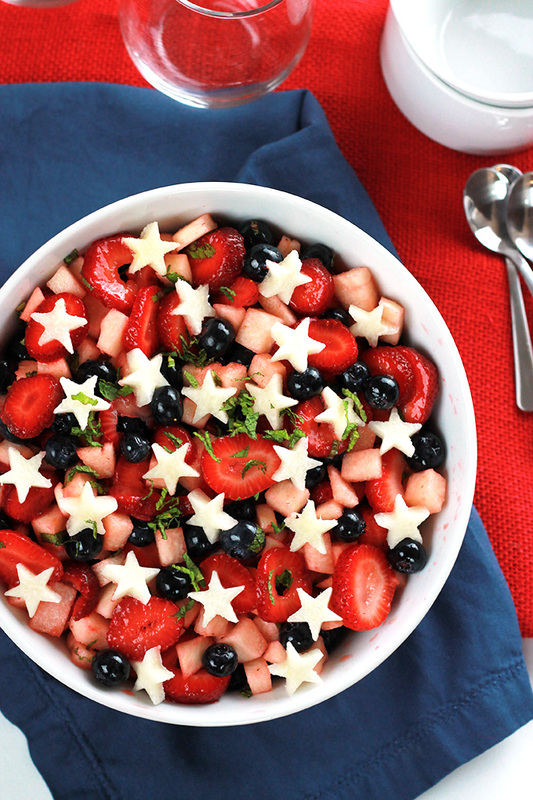 To make my salad more festive and patriotic, I cut little stars out of the jicama and placed them on top before serving. Wash and hull strawberries, place on a paper towel and pat dry. Slice strawberries into a large bowl. Wash and pat dry blueberries and add to the strawberries. Peel and slice a large jicama in half. Place jicama flat side down and slice 4 to 5 ¼ to ½ inch slices and set aside. Continue to slice and dice the remaining jicama until you have 2 cups. Place jicama in the bowl with the berries, add the lemon or lime juice and mint. If you want to add an extra bit of sweetness, drizzle with a small amount of agave nectar, I added 3 teaspoons. Toss gently with a spoon or use your hand to mix. Transfer to serving dish. 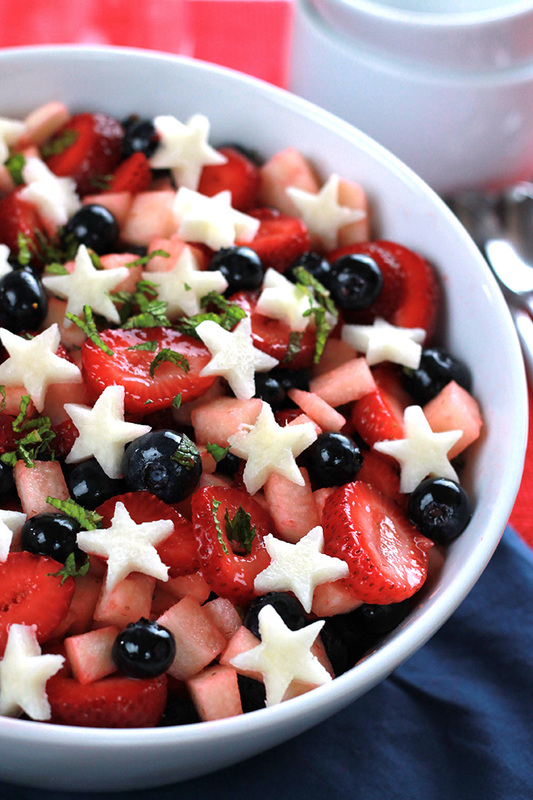 For an extra patriotic feel cut stars out of the sliced jicama that was set aside earlier and place on salad. If you make this recipe or a version of it, take a picture and share with me on Instagram, tag it #thewholeserving or leave a comment below. I’d love to see or hear about your version of this Strawberry, Blueberry, Jicama Salad. 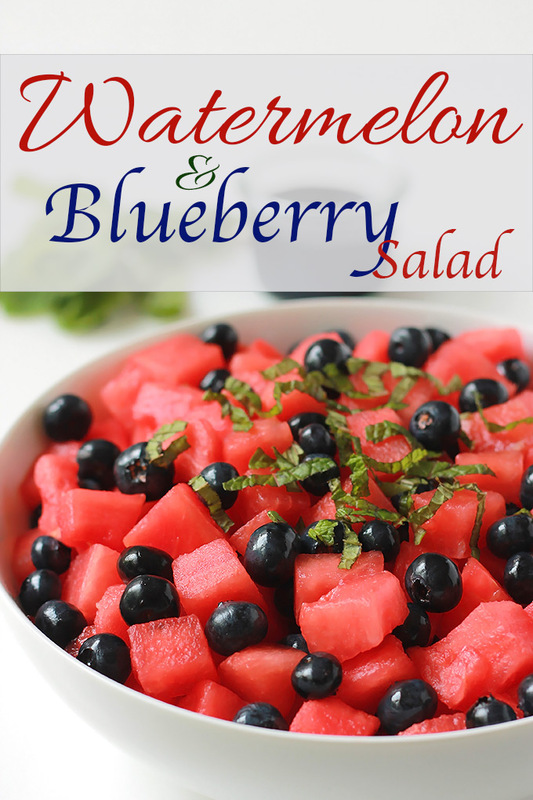 If you like this salad you may like this Watermelon and Blueberry Salad. 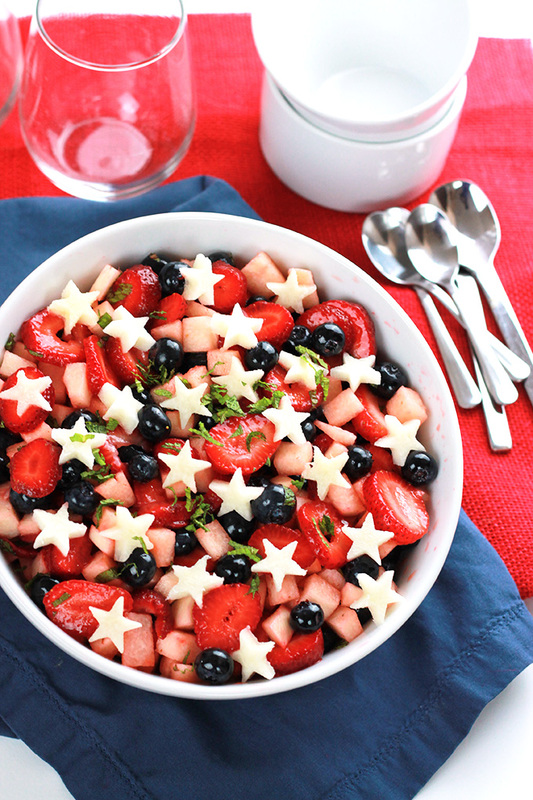 such a cute salad for memorial day or the fourth. summer too! i never have tried jicama before either – so thanks for the inspiration. Thalia thanks for visiting, I hope you give this one a try soon. Have a wonderful weekend. Thanks Chris, I certainly hope you enjoy it as much as we do in my house. I’ve used jicama in a more savory salad with radishes, but never thought to add it to fruit salads! This looks delicious. The crispy jicama would be a great contrast to the berries. Erin it really is a great contrast. I have hardly ever used it in savory dished, I’ll have to give it a try soon. Such a beautiful salad! I love the jicama stars 🙂 What a great idea for a festive treat to bring to summer BBQs. Thanks Zena, It gives the salad a nice crispy crunch. BTW I love your name and the name of your blog. Thank you for sharing at #OverTheMoon. I am looking forward to seeing what you choose to share next week! Thanks Marilyn, I need to set a timer for linking to your party. Thanks for sharing your brilliance. Thanks Lynn, I hope you get to try this soon and I hope you and your family enjoys it. Wow, I have never thought to put Jicama with fruit! This looks so good! 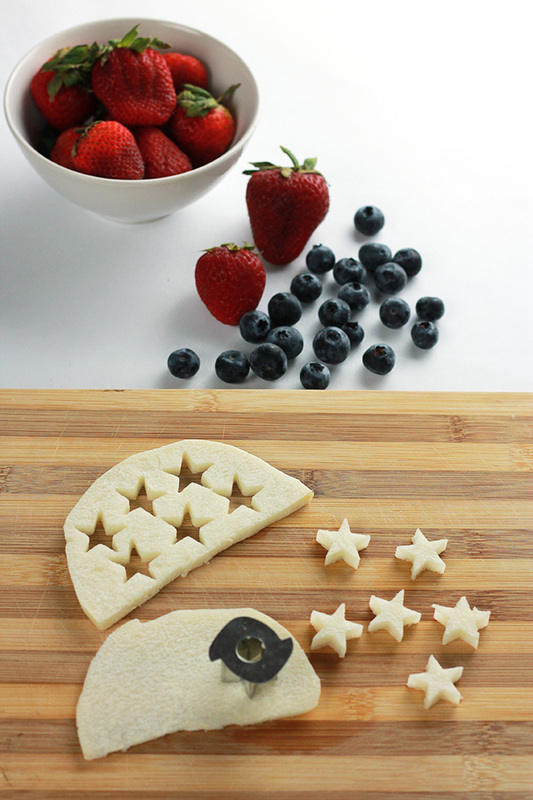 I love the star shapes made out of Jicama! I am going to have to try this! Thanks for sharing at Merry Monday! The Jicama adds a nice crispness to the salad and its pefect for summer entertaining. Hi Celeste! This salad looks so good! I have pinned it. I have also chosen it as my featured post for the Over the Moon Link party. Hope you’ll link up again this week – party goes live at 5 pm CST on Sunday. You can link up through my blog! Thanks Cathy, I’m glad you like it and thanks for letting me know about the feature and it’s nice to know the go live time, I always seem to miss it. This is a nice salad to have all summer long. I hope your family enjoys it Jamie. Tanks Karren, and this is a nice salad for all the summer gatherings. 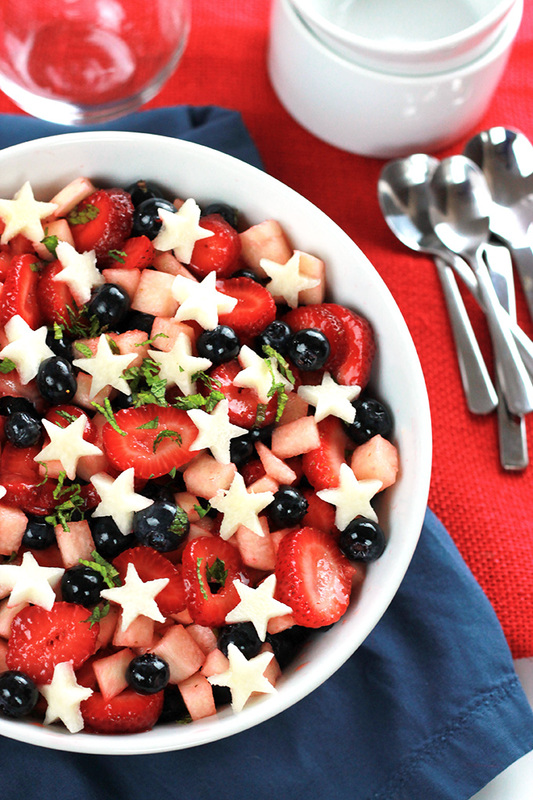 This gorgeous salad will be the centerpiece of my 4th of July BBQ! I am so delighted that you shared colorful and patriotic Strawberry, Blueberry, Jicama Salad with us at the Healthy Happy Green Natural Party! I’m Pinning and sharing this! Looks delicious and so nutritious. I love the strawberry & watermelon. So easy to make and colorful plus the taste is so refreshing for summer. Sharing! Thanks Maria, Everyone loved it. BTW you have a pretty name, my middle name is Maria. Wow! Is this ever eye catching! In the summer months I really crave fruit and this fits that craving. As I started reading I was thinking that I needed to ask you what jicama tasted like, then I ran across the answer. I think I’ve only ever used it once and it was a long time ago! I’m going to pick some up my next trip to the store! Thanks, I really appreciate the feature and I really enjoy linking up each week.